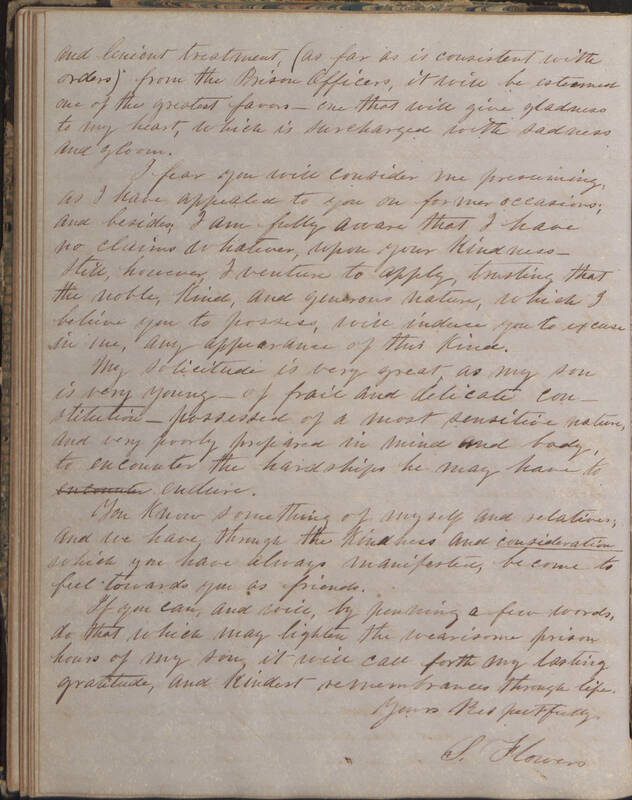 Item description: Letter from Seraphina Brooks Flowers to Lt. G. C. Lockwood, 17 July 1864. 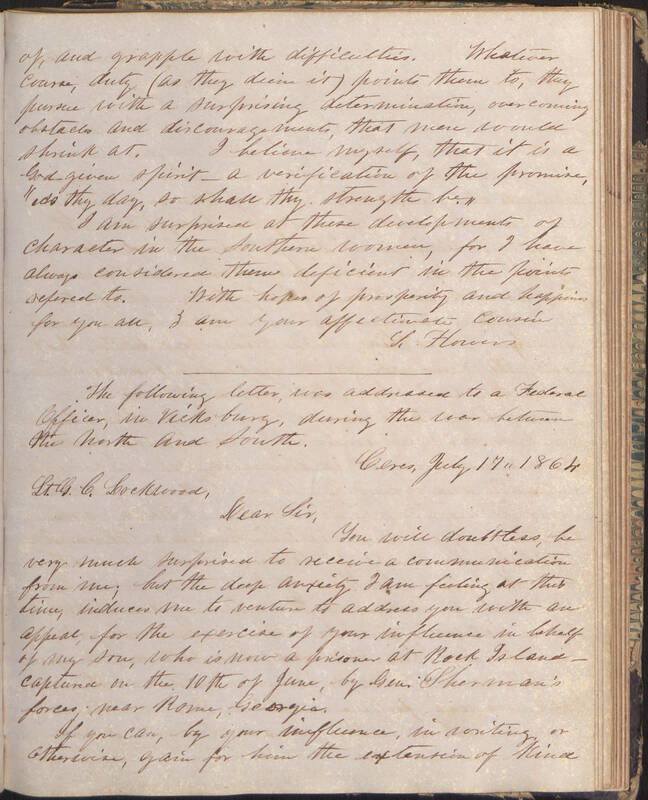 Flowers writes Lockwood, a federal officer, to petition to see her son who was taken prisoner. Item citation: From folder 56 of the Craig, Ferris, and Flowers Family Papers #5323, Southern Historical Collection, The Wilson Library, University of North Carolina at Chapel Hill. The following letter, was addressed to a Federal Officer, in Vicksburg, during the war between the North and South. You will doubtless, be very much surprised to receive a communication from me; but the deep anxiety I am feeling at this time, induces me to venture to address you with an appeal, for the exercise of your influence in behalf of my son, who is now a prisoner at Rock Island ___captures on the 10th of June, by Gen. Sherman’s forces near Rome, Georgia. If you can, by your influence, in routing, or otherwise, gain for him the extension of kind and lenient treatment (as far as is consistent with orders) from the Prison Officers, it will be esteemed one of the greatest favors __ one that will give gladness to my heart, which is surcharged with sadness and gloom. I fear you will consider me presuming as I have appealed to you on former occasions; and besides; I am fully aware that I have no claims whatever, upon your kindness_Still, however, I venture to apply, trusting that the noble, kind, and generous nature, which I believe you to possess, will induce you to excuse in me any appearance of this kind. My solicitude is very great as my son is very young __of frail and delicate constitution __ possessed of a most sensitive nature, and very poorly prepared in mind and body to encounter the hardships he may have to encounter endure. You know something of myself and relatives; and we have through the kindness and consideration which you have always manifested, become to feel towards you as friends. If you can, and will by penning a few words, do that which may lighten the wearisome prison hours of my son, it will call forth my lasting gratitude, and kindest remembrances through life. This entry was posted in Southern Historical Collection and tagged Civil War, Confederate Army, prison, Seraphina Flowers. Bookmark the permalink.